Maintaining large collections of Ebooks can become a nightmare, if not maintained properly finding the desired books is also a difficult job. Calibre is a one word solution to this problem. calibre is free and open source e-book software that organizes and manages e-books, supporting a variety of formats. It also supports e-book syncing with a variety of popular e-book readers and will convert e-books between differing formats. Calibre helps you catalog your e-book collection. First, it surveys all the e-books and other relevant files residing either on your hard drive or your e-reader, and then inserts them into Calibre’s main directory. Once that information is in the directory, you can use it to organise, categorize, annotate, search, rate and save to disk. You can customize or delete any of the data fields Calibre fills in, or add your own. Calibre will even go out onto the internet to find book metadata based on existing title/author or ISBN information. It can download various types of metadata and covers for your books, automatically. It can rescale all font sizes, ensuring the output e-book is readable no matter what font sizes the input document uses. 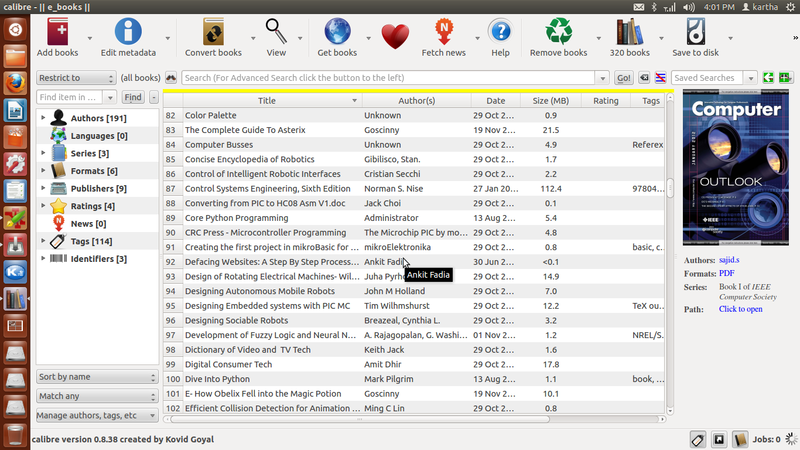 It can automatically detect/create book structure, like chapters and Table of Contents. It can insert the book metadata into a “Book Jacket” at the start of the book. Calibre can automatically fetch news from websites or RSS feeds, format the news into a ebook and upload to a connected device. Calibre has a built-in web server that allows you to access your ebook collection using a simple browser from any computer anywhere in the world. It can also email your books and downloaded news to you automatically. Calibre serves the purpose it was made for efficiently so you no longer have to worry about searching your whole file system to find an ebook. I have found it to be one of the most usefull software in the opensource world. Especially the feature to share your books online is an added advantage and setting up the calibre server is an easy task. Calibre is availble for Windows ,Mac and Linux. A portable version of calibre is also available so that you can carry around your library in a pendrive, Installing calibre is a straight forward affair and in ubuntu it is available in the software center. I hope this article serves as an introduction to calibre for those who have not yet heard about it. Check http://www.calibre-ebook.com for more details. Posted on May 6, 2012, in Technical and tagged e book, e reader, input formats, software, technology. Bookmark the permalink. Leave a comment.